As business leaders in an increasingly interdependent world, alumni maneuver changes in technology, trade and regulations. Computer gaming lab primes alumni for a growing multibillion-dollar industry. 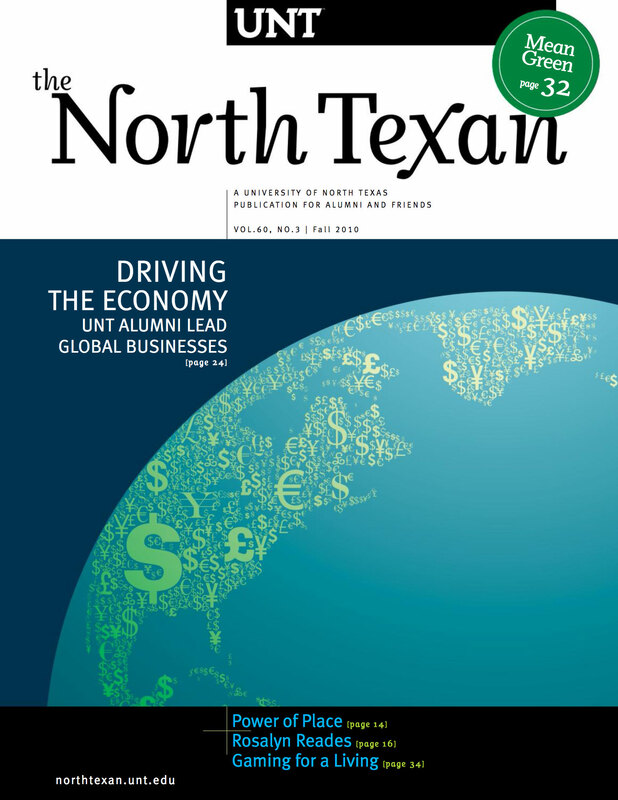 UNT continues its rise to the top with research opportunities and hands-on learning. Abner Haynes (’62) is being remembered as part of the region's greatest football moments. Jennifer Watson (’95) remembers the moment she found her true love — at the Delta Lodge. New building features state-of-the-art labs and endless opportunities for researchers and students. Four rooftop greenhouses on the Life Sciences Complex are supporting plant programs. Doctor takes charge using lessons learned as an honors student and athlete at UNT. Watch a video on the dynamic features of the new facility. Engineering researchers at Discovery Park are working to build a network of wireless sensors. Twenty double bassists from around the world competed at UNT in June. In honor of 58 spirited Mean Green years, UNT celebrates Fouts Field’s final season of football. UNT community uses seed planted by environmental legacy to grow leadership in sustainability issues. Lisa Dobson (’82) went from cutting out dresses for her Barbies to patterning a career. Alumnus David Rosenbaum started and grew a successful fireworks business while still a student. UNT rolls out the welcome mat for a new flock of students this fall. Discover the power of pregame with the new alumni pavilion and reserve your place in UNT’s history. UNT scientists and philosophers are trying to find ways to support ecotourism. How can you stay healthy for a flu-free fall? Singer/songwriter Sara Hickman (’86) is promoting the arts for children. Mark Hundley’s journey through grief leads to a 2011 mega-walk for a good cause. Jake Heggie will serve as the artist-in-residence for the Institute for the Advancement of the Arts.